The official celebration of the 74th anniversary of the liberation of the Auschwitz-Birkenau death camp by the Red Army was an utter disgrace. Not only were extreme right-wingers and open anti-Semites allowed to stage a rally and shout slogans like “It’s time to stand against Jewry and free Poland,” but the Prime Minister Mateusz Morawiecki implied that the Holocaust was not so much a consequence of Nazi ideology but rather of some innate characteristics of the German nation. Hundreds of journalists, Holocaust survivors and their family members from around the world, who gathered to commemorate the shut down of one of the most symbolic places of the Holocaust, were exposed to a bizarre and disgusting performance in two acts. The central personage of the first act was Piotr Rybak. A well-known Polish nationalist and anti-Semite convicted for burning an effigy of a Jew during a right-wing rally on one of the central squares in Wrocław, a large city located in south-western Poland. This time he led a demonstration in the town of Oświęciem, the Polish name for Auschwitz, where the camp had been located. The main message of Rybak, and the people mobilizing with him, was that Poland today is not an independent state because it is ruled by Jews. “It’s high time to free Poland from all Jewry! Where are the rulers of our country? Where are they? At the trough! And this has to change! 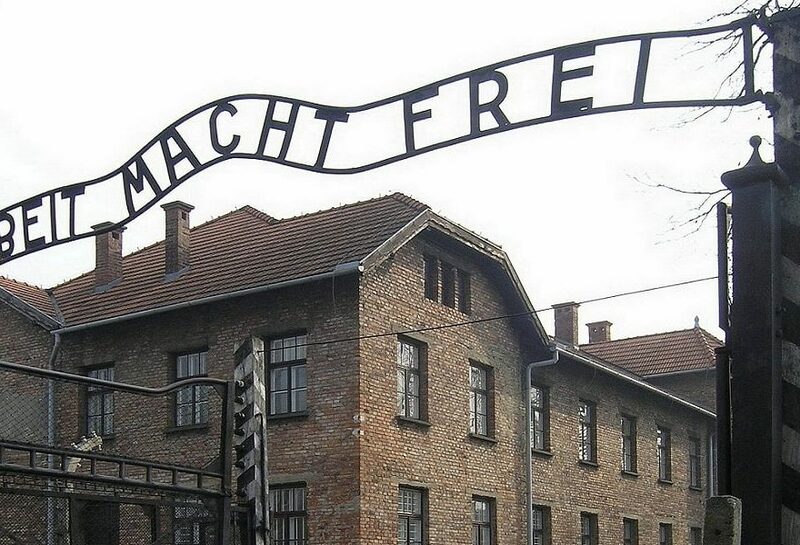 God bless Poland!” shouted Rybak at the main gate of the death camp where it an estimated 1 million Jews were tortured and executed during WWII. Many of the people who gathered to take part in the official commemoration were outraged and approached the police asking them to intervene and dissolve the assembly, as it was utterly offensive and most certainly breached laws regarding the incitement of hatred. The police did nothing. The show lasted for over an hour and included various openly anti-Semitic and nationalistic chants with religious ornaments: The prayer ‘Our Father’ was intoned multiple times. As if this was not enough, the official ceremony with the presence of the Polish PM Mateusz Morawiecki was a devastating spectacle of cascading historical misinterpretations and manipulations. “This act of annihilation was not perpetuated by some Nazis but by the Hitlerite German state. The German nation was feeding on fascist ideology which then and later and even now historians describe and define that way. But the entire evil came from this particular country and it cannot be forgotten. Otherwise one would be relativizing evil.” This statement by Morawiecki was clearly meant to suggest that there are metaphysical genocidal inclinations within the German nation that are permanent and independent of ideology, culture, politics, and which are also timeless and ahistorical. Clearly the Polish prime minister’s speech was intended to exploit and strengthen the second (after Russophobia) most important nationalist leverage – the anti-German sentiment. Morawiecki was trying to be critical of the Nazis while also redirecting the blame from the ideological platform of the Third Reich political machine onto the German national character. One could actually admire Morawiecki’s consistency: In February of last year he was even less critical of the Hitler regime of Nazi Germany and participated in an official ceremony of commemoration for the so-called Holy Cross Mountains Brigade, a notorious Nazi collaborationist and obsessively anti-communist Polish guerilla formation. Towards the end of the war many SS soldiers were incorporated into its ranks and the militia openly collaborated with the Gestapo – Htiler’s secret police. One of their prominent members, Hubert Jura, is known to have chased and murdered Jews who escaped from ghettos and concentration camps. To make it all even more interesting it should be remembered that the commemoration happened in Germany during a pause in a major geopolitical summit in Munich, Germany. This is the city where pro-Nazi partisans escaped and hid from the approaching Red Army in 1945. Morawiecki visited their graves and laid flowers there. The Polish police have stated on Twitter that they are analyzing the event recordings and have handed over to the prosecutor’s’ office what they claim could be evidence of law breaking by the demonstrators.